1872-1905 autograph album that belonged to Julia Joanna Jerome of Irasburg, Vermont, before and after her marriage to Francis Edgar Ballou of Swanzey, New Hampshire. Irasburg was spelled Irasburgh in that era. 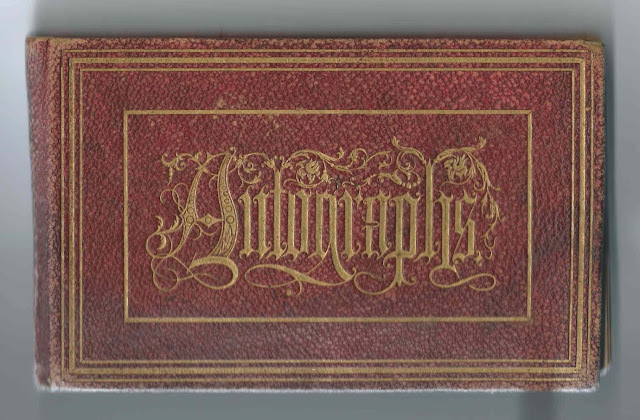 The album is approximately 6-3/4" x 4-1/4" and contains the sentiments of 75 of Julia's relatives and friends, including pages signed by her children with husband Francis E. Ballou. An alphabetical surname list and an alphabetical list of the signers, together with any personal information they offered, appear at the end of this post. 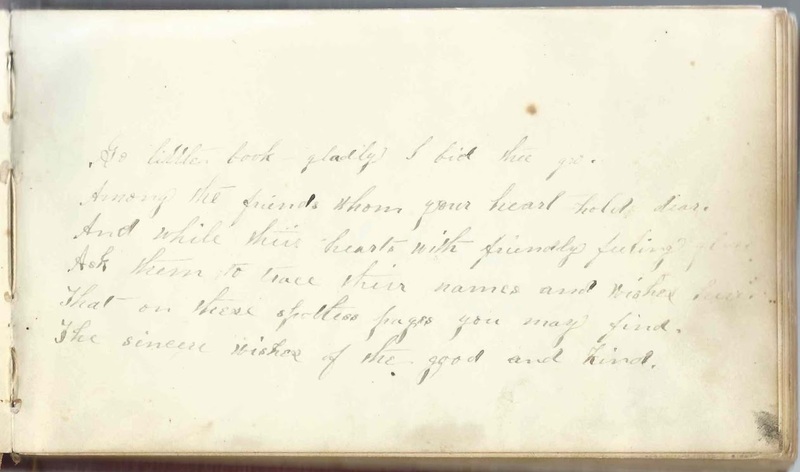 Julia inscribed a page of welcome to the well wishers who would be writing in her album. Julia Joanna Jerome, or Julia Johanna Jerome, was born June 1851 at Burke or Berkshire, Vermont, the daughter of Eri Bronson Jerome and Joanna (Martin) Jerome. 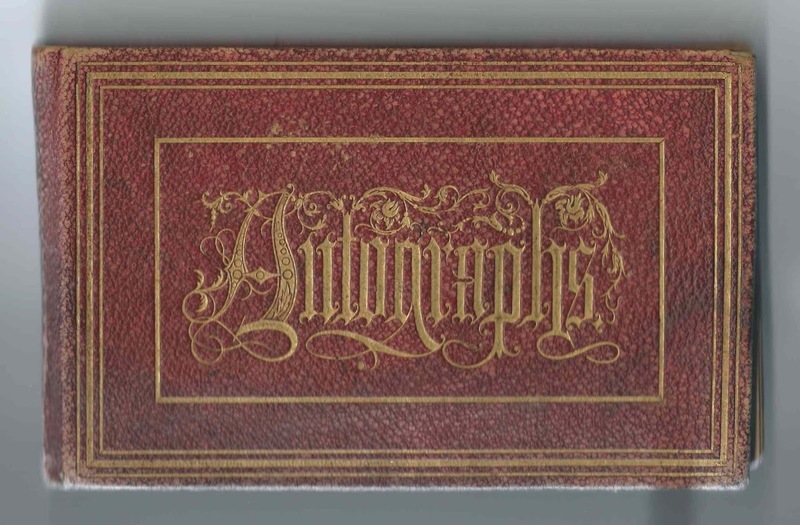 Many members of the Jerome, Martin, Drew and Newell families inscribed pages in the album. Among them, Julia's sister Estella Acheson (Jerome) Drew, her husband Ira Sweatland Drew and two of their children, daughters Ina Estelle Drew and Sadie Eudora Drew, all of Irasburg, Vermont, left sentiments in the album on March 2, 1873. Estella left a long sentiment on one page, and Ira and the girls inscribed the facing page. See the list of signers below to see the names of others of Julia's siblings, relatives and in-laws who left sentiments in the album. On June 23, 1873, Julia Joanna Jerome married Francis Edgar Ballou, son of Willard J. and Abigail (Forestall) Ballou. "Frank" was born January 26, 1844 at Richmond, New Hampshire. He inscribed a page in Julia's album, perhaps in early 1873 just before their marriage; the exact date is hard to read. Julia and Frank settled at Swanzey, New Hampshire, and had, I think, eight children, at least one of whom died in infancy. Several of them signed pages in the album, including Orilla M. Ballou; Charles Jerome Ballou; Avis Mertie Ballou; and James Munroe Ballou, who signed with his bride Pearl Inez (Dickinson) Ballou, who were then living at Winchester, New Hampshire, on August 12, 1900. They later divorced, and James married Clara M. Wallace. Frank died in 1930, and Julia in 1935. If you have corrections and/or additions to the information above, or information on any of the signers listed below, please leave a comment or contact me directly. Thanks! Helen; the rest of her personal information is rubbed out; her surname could possibly be Thurlow or Wheeler or the word could denote a place name. L., or Lu, at Barton, Vermont, on April 19, 1872. Wrote a sad poem or song about a woman waiting, and waiting, for her husband to come home. F. E. Ballou of Swanzey, Vermont, signed in January 187x [struckover,; possibly 1873]. Julia's future husband Francis Edgar Ballou. Very faint, possibly Miss Rilla or Mira Rilla. Presumably Julia's daughter Orilla M. Ballou, who signed another page in the album. Joseph W. Ballou of Swanzey, New Hampshire, signed on September 4, 1881. Joseph Willard Ballou was a brother to Julia's husband Francis E. Ballou. Joseph's wife Flavilla M. (Taft) Ballou signed the right facing page. Flavilla M. Ballou of Swanzey, New Hampshire, signed on September 4, 1881. She was Flavilla M. (Taft) Ballou; her husband Joseph M. Ballou, brother of Julia's husband Frank E. Ballou, signed the left facing page. Mr. and Mrs. J. M. Ballou of Winchester, New Hampshire, signed on August 12, 1900. "Your Son and Daughter. They were newlyweds James Munroe Ballou and his first wife Pearl I. (Dickinson) Ballou; they were later divorced, and James married Clara M. Wallace in 1907. Frank L. Ballou of Swanzey, New Hampshire; son of Julia's brother-in-law Joseph Willard Ballou and his wife Flavilla M. (Taft) Ballou. Nora A. Ballou of Swanzey, New Hampshire; daughter of Julia's brother -in-law Joseph Willard Ballou and his wife Flavilla M. (Taft) Ballou. Charley W. Beardsley of Wolcott, Vermont. Charles W. Beardsley, whose wife Sarah Jane (Lanphear) Signed the right facing page. Sarah J. Beardsley of Wolcott, Vermont. She was Sarah Jane (Lanphear) Beardsley, whose husband Charles W. Beardsley signed the left facing page. Estella A. 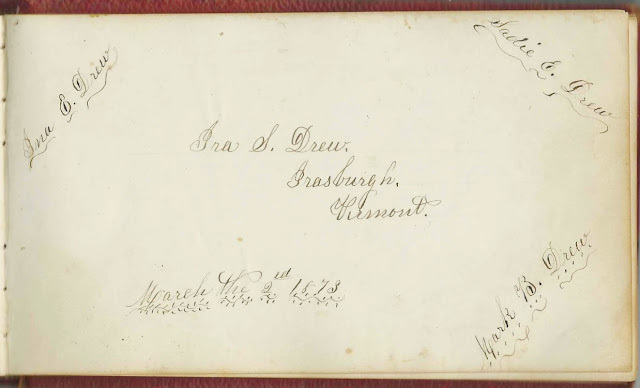 Drew of Irasburgh,Vermont, signed on March 2, 1873; "your affectionate sister. She was Estella Acheson (Jerome) Drew, Julia's older sister. Estella's husband, Ira Sweatland Drew, signed the right facing page. Ira S. Drew of Irasburgh, Vermont, signed on March 2, 1873. His wife Estella Acheson (Jerome) Drew, Julia's sister, signed the left facing page. Also signing Ira's page were their daughters Ina Estella Drew and Sadie Eudora Drew. Ira C. Fisher of North Richmond, New Hampshire, signed on October 9, 1877. His wife, Sarah Frances (Whipple) Fisher signed the right facing page. Frances S. Fisher of North Richmond, New Hampshire; her husband Ira C. Fisher signed the left facing page. She was Sarah Frances (Whipple) Fisher. C. J. Hunt. "When this you see think of the one that first saw thee." Was the signer a doctor or midwife? Lyman H. Jerome of North Richmond, New Hampshire. Julia's brother and father of signer Oliver B. Jerome; shared the page with his son Oliver B. Jerome. Myra J. Jerome, signed on August 7, 1892; "your niece". She might possibly be Almira Jerome, daughter of Julia's brother Philo Jerome and his wife Amy (Miller) Jerome. Leon M. Jerome of New London, Connecticut, signed on April 12, 1905. He was the son of Julia's brother Philo B. Jerome. Helen A. Jerome of Royalston, Massachusetts, signed on December 24, 1882. She was Helen A. (Drew ) Jerome, whose husband Benjamin B. Jerome, Julia's brother, signed the right facing page. Benjamin B. Jerome of Royalston, Massachusetts, signed on July 17, 1881. He was Julia's brother. His wife Helen A. (Drew) Jerome signed the left facing page. L. H. Kittell of Sheldon, Vermont, "Hubbie Kittell". He was Lewis H. Kittell, "Hubbie", whose wife Elizabeth A. (Martin) Kittell, "Libbie", signed the right facing page. Libbie A. Kittell of Sheldon, Vermont. She was Elizabeth A. (Martin) Kittell, "Libbie", whose husband Lewis H. Kittell, "Hubbie", signed the left facing page. Otis Martin of North Richmond, New Hampshire, signed on April 22, 1877. He was Otis Martin, Jr., whose wife Lucretia M. (Martin) Martin, "Cretia", signed the right facing page. Cretia M. Martin, signed at North Richmond, New Hampshire, on April 22, 1877. She was Lucretia M. (Martin) Martin, whose husband Otis Martin, Jr., signed the left facing page. Hubbard N. Martin of East Sheldon, Vermont. He was Nathaniel Hubbard Martin; his wife Arvilla C. (Randall) Martin signed the right facing page. Mrs. Arvilla C. Martin of East Sheldon, Vermont. she was Arvilla C. (Randall) Martin, whose husband Nathaniel Hubbard Martin signed the left facing page. Their daughter Anna E. Martin signed on her mother's page. Hat. she was Hattie E. (Barden) Martin, whose husband Silas O. Martin signed the right facing page. Their son Perez Adelbert Martin signed on his mother's page. Silas O. Martin of Richmond, New Hampshire, signed on March 26, 1883. His wife Hattie E. (Barden) Martin signed the left facing page. Their daughter Stella R. Martin signed on Silas' page. Emily B. Newell of North Richmond, New Hampshire. She was Emily B. (Harris) Newell, whose husband Nathan F. Newell signed the right facing page. Nathan F. Newell of North Richmond, New Hampshire, signed on April 12, 1877. His wife, Emily B. (Harris) Newell, signed the left facing page. G. H. Phillips of Keene, New Hampshire, signed at Swanzey, New Hampshire, on September 4, 1883. Not sure of initials. C. F. Robinson of East Deerfield, Massachusetts, signed on March 26, 1905. Mrs. C. F. Robinson signed the overleaf. Mrs. C. F. Robinson of East Deerfield, Massachusetts, signed on March 26, 1905. Her husband, C. F. Robinson, signed the overleaf. Thanks for your inquiry. There's an email address under Inquiries in the right margin near the top.